The valley of Dry Creek, the home of Southern Pomo tribelet Mihilakhawna, became a portion of the 17,000 acre Tzabaco Rancho when 14 year old José German Piña applied for a Mexican land grant on September 14, 1843. José German Piña was the son of a Mexican soldier, born at Mission San Francisco de Asís (Mission Dolores in San Francisco) in 1829. By the time he was 11 years old he was scouting for potential rancho land in the Russian River valley. 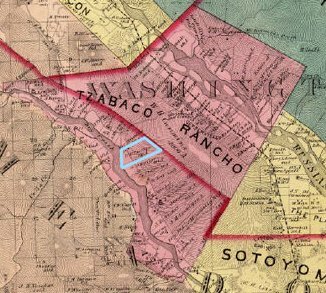 At the perhaps not-so-tender age of 14, in September 1843 he made a successful petition to Governor Micheltorena in Monterey for a tract of 4 square leagues (about 17,000 acres) to be known as the Tzabaco Rancho. The origin of the adobe which was at the heart of his new grant is not fully understood. One theory is that the adobe is, in fact, the fortification that General Mariano Vallejo caused to be established in 1833 “somewhere in the Russian River valley” – an outpost that lasted only a month. Supporting this idea is the fact that a cannon and several 2-pound cannon balls were found on the property during the early twentieth century. The conservative theory is that the adobe was built in 1843 by the Piña family as the headquarters of their new rancho. When German, also known as “Chino” (“curly haired”), settled on his rancho his older brother José de Jesus and several other family members joined him. 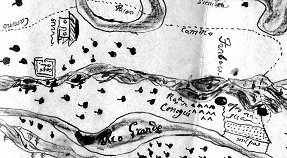 The diseño (map) which accompanied the grant identified the rio (Dry Creek), Rio Grande (Russian River), siembre (grain fields), and milpas (seeded field) among other notations. One year later, in 1844, German’s mother died and in 1847 German’s father Lazaro was killed at the Battle of Cerro Gordo in Mexico under the leadership of Santiana. At eighteen years of age in 1847, José German Piña died of unknown cause at Mission San Francisco de Solano in Sonoma. Everything German did seemed to belie his age – scouting for land, petitioning for rancho land, establishing the Tzabaco Rancho. Even his will spelled out his possessions, debts, and debtees – although just passing mention is made of his rancho. He even identified a trade for the horses to pull his hearse. With increasing family debt by 1850, a portion of the rancho was sold at public auction. Squatters settled on other parts of their land. After the murder of German’s brother Antonio in 1853, the remaining four brothers, for $20,000 compensation, signed over their interest in the rancho to John Frisbie, an American entrepreneur who was acting as the attorney for the Piñas. However, the contract would not take effect for 5 years. The Land Commission spent the years 1852-1855 reviewing the validity of Tzabaco Rancho, which was finally confirmed at 15,439 acres. In 1855 partners Samuel O. Heaton and Duvall Drake Phillips journeyed to Sonoma County to survey land for purchase. It is not known why they came specifically to Sonoma County. However, a close friend of D. D.’s from his Missouri and Army days was Sterling Coulter (later a prominent Sonoma County citizen) who had settled in the Santa Rosa area in 1851. 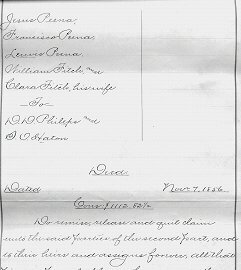 Rebuffed by the Piñas in 1855, Sam and D. D. returned in October 1856 and successfully and legally bought 137¼ acres of the Piña’s Tzabaco Rancho for $1112.82½ in cash. The adobe was reputed to have bear skin doors, peep hole windows and dirt floors. Before long, D.D. had his wife’s shipwright brother travel to California to add a wooden second story to the adobe as well as add oak flooring. The finished home is pictured at the top of the page. For more interesting historical tidbits about the early settlers of Healdsburg, please visit Hannah Clayborn’s History of Healdsburg, especially the sections about Cyrus Alexander, Captain Henry Delano Fitch, Colonel Roderick Matheson and the Heald family and founding of Healdsburg!